The banya is the traditional Russian spa and it constitutes one of the most important activities in Russia, not only because it is a site of relaxation, health and well-being, but also because it is a place to socialize with friends or family. 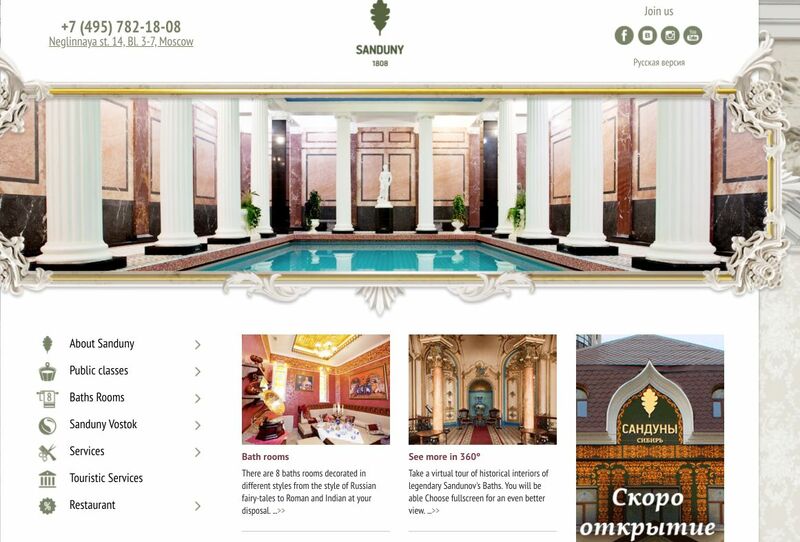 The Sanduny Baths in Moscow are the most famous in Russia. Below I will explain how to organize the visit. 1. What is a Russian banya? The Russians say that you haven’t really been in Russia if you didn’t take a good bath in a typical Russian banya, which includes sauna, massage and relaxation therapies, more or less comparable to modern day spas. The banya remains one of the most important weekly activities for many Russians, since it is deeply rooted in Russian culture, born in the old Viking settlement of Veliky Novgorod (southeast of St. Petersburg). For the Russians, it is a place not only to relax but also to eat and drink with friends and to “cleanse the soul and heal the body of any disease”. Needless to say, Russia is a country where it is very cold. 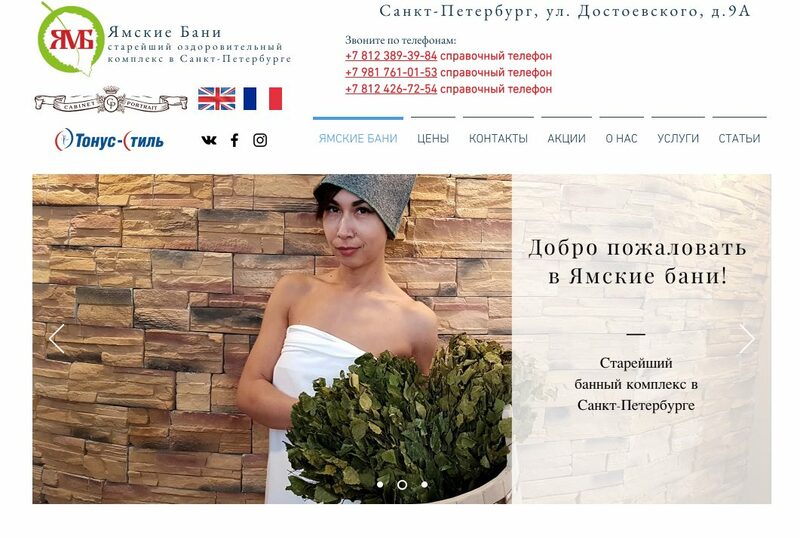 It is a very healthy and highly recommended habit, so I will explain below the different types of banyas, what is the ritual of a banya, as well as the main banyas of Moscow and St. Petersburg if you want to visit any, which I heartily recommend during your stay in Russia. In Russia, the local tv stations broadcast every year the New Year’s Eve comedy Ирония судьбы, или С лёгким паром! (The Irony of Fate, or Enjoy Your Bath!) by Eldar Ryazanov, filmed in the Sanduny Baths, and which reflects very well what a Russian banya is. 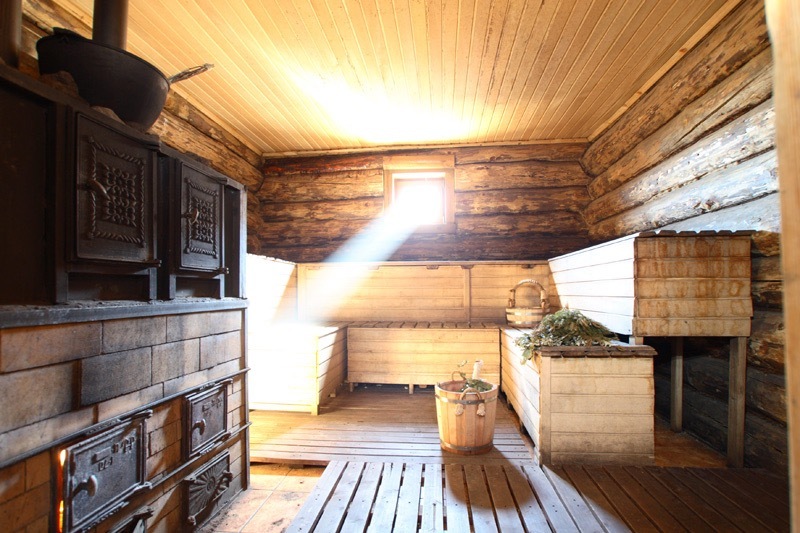 Many Russians have a private banya for the family in their dachas (country houses), in a small wooden hut (see cover photo of this article). However, in large cities there are public banyas open to the general public and in which an entrance fee is paid for its use. The best and most famous public banyas are located in Moscow and St. Petersburg. It should also be noted that there is a banya museum in the Siberian city of Ust-Barguzin, on the shores of Lake Baikal. These are the oldest and most luxurious in Moscow. Inaugurated in 1808, they are inside a beautiful Beaux Arts style monument. It is the place where the city’s personalities and businessmen come as a place to close deals. I’m not going to dwell on these baths since I will talk about them in more details below. You can visit them by taking a guided tour to get to know the building inside and out or, better yet, using its facilities. They are not as old as the Sanduny Baths, but they rival in popularity. They were inaugurated in 1938 and have many private rooms with different designs and for small groups. Also inaugurated in 1938, these are another option. It occupies a 4-storey building that was rehabilitated a few years ago, so they have modern facilities. These are probably the most popular and historic baths in St. Petersburg. They were the baths preferred by Lenin or Dostoevsky. 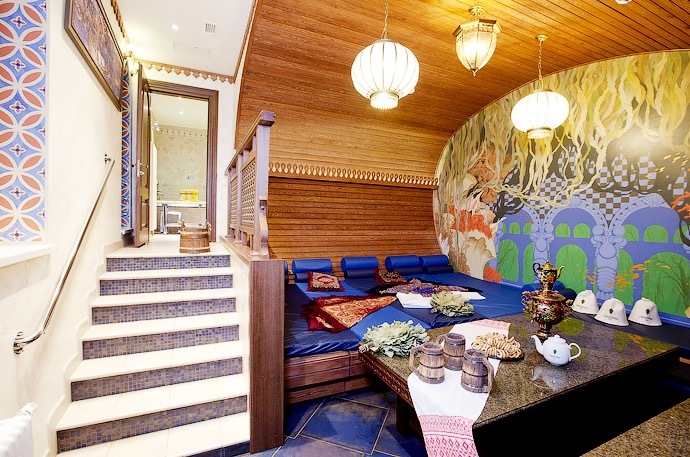 It is a traditional Russian banya that also offers services, such as a health and wellness center. Built for the population with few resources, they were one of the first public baths in the city. It is one of the most frequented baths by residents. Another option is the Degtyarnye Baths, located next to Nevsky Avenue and with more than 50 years of history. A first space that serves as a dressing room and resting area and where food or drink is served while chatting with your friends, colleagues or family. In the lockers of this room you can keep your things and you will be totally naked, though you can cover yourself with a towel and, of course, wear a wool hat that serves to protect the head from the heat. A second space is the shower and bathroom. 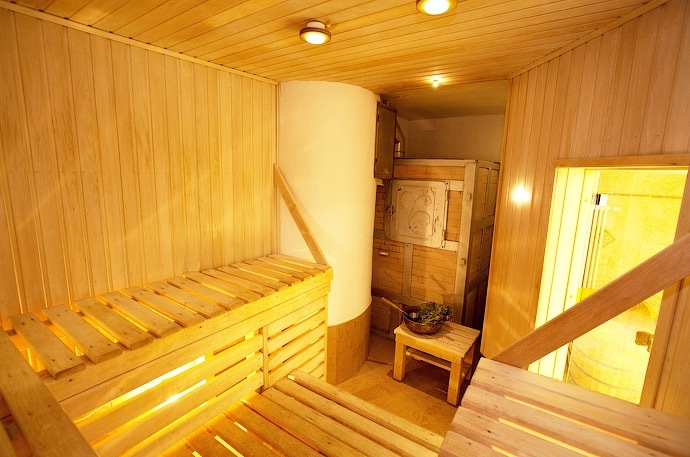 The third space is the sauna. The ritual consists of taking off your clothes in the dressing room area, take a shower first and then move on to the steam sauna in which you will have to endure temperatures that can exceed 100 degrees Celsius. When leaving the sauna, you should take another shower, this time with buckets of cold water above and re-enter the sauna. When you have done this ritual several times, you go out to the rest area to talk with your friends, eat and drink something, then go back to the circuit again. All this ritual can last a couple of hours. 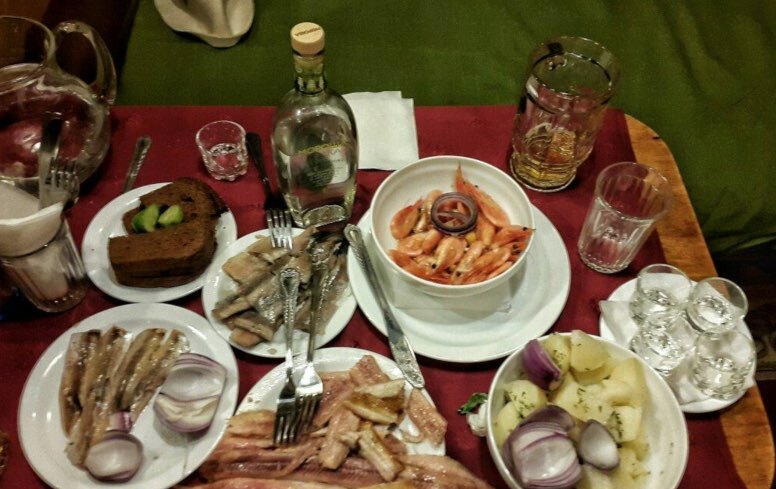 During breaks, the Russians like to drink tea, kvass, vodka or beer, accompanied by food. In the country houses (dachas), instead of throwing away the bucket of water, it is enough to leave the cabin and lie down in the snow for a few seconds, and then go back into the cabin. 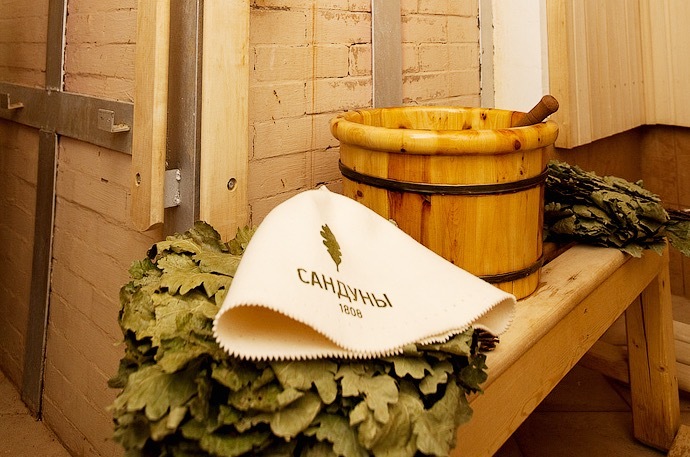 During the time you are in the sauna, it is customary to lash the back of the participants, either by the partners or by some employee of the banya, with a branch of dried birch or eucalyptus leaves, which is called venik (broom) and that serves to improve circulation. Therefore, you leave the sauna with very “pink” skin. During the tour you will sit and walk naked with friends, colleagues or strangers, so you do not have to feel ashamed. The oldest and most luxurious public baths in Moscow are the Sanduny Baths, which have functioned since 1808 in an architectural jewel of the 19th century in the Beaux Arts style. The baths are located in the center of the city, at number 14 on Neglinnaya Street, a street that goes from the Bolshoi Theater to the Trubnaya Square and that it was paved in 1819 over the Neglinnaya underground river. The Sanduny Baths are named after their founder, Sila Sandunov (1756-1820), a Georgian businessman and actor in the court of Catherine II in the 1790s, who bought the land in 1800 to build the baths. 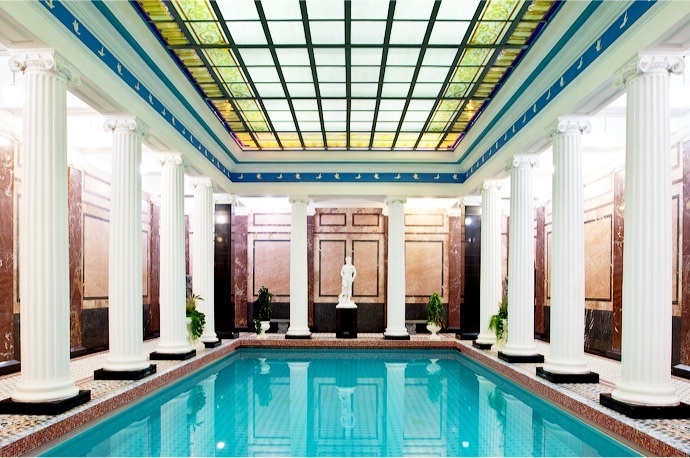 As curious fact: the most luxurious pool of the Sanduny Baths, of Roman style, was used in 1925 by Sergei Eisenstein to replicate the raging waters of the Black Sea and he filmed some shots with small boats for his masterpiece Battleship Potemkin. 50 years later, in 1975, the Sanduny Baths reappeared in a Russian film, The Irony of Fate, of which I spoke at the beginning of this article. How do the Sanduny Baths work? To use the Sanduny Baths you have two possibilities: pay the general admission fee to use the public area or rent a private room among several (if you want more privacy). There is also a third possibility that is to make a guided tour of its facilities on closing day (on Tuesdays). Usually, the reception staff speaks only in Russian (perhaps some English), so it is best to be clear about what services you want to use to avoid misunderstandings. I will explain below how both the public area and the private rooms rental work. The general entrance of the Sanduny baths gives access to 2 hours in public common rooms (3 hours in women’s rooms). This is the most common way to use these baths and it is a good way to socialize and meet local people. They usually work until 11pm. You pay for the general admission fee (which is not very expensive) and when leaving you must also pay for the extras used (bathrobe, towels, flip flops, birch branches, hat, etc). All these extras (which you can also bring from your home or hotel) are those that can make the bill rise more than you had planned. 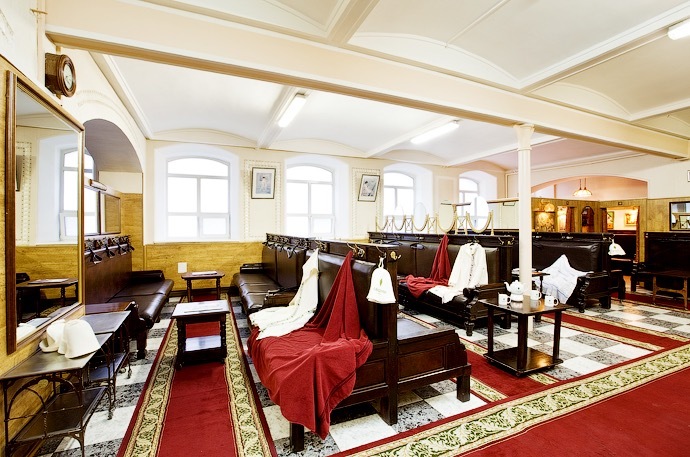 Male Top Class Bath House, with a historic decoration of the rooms. 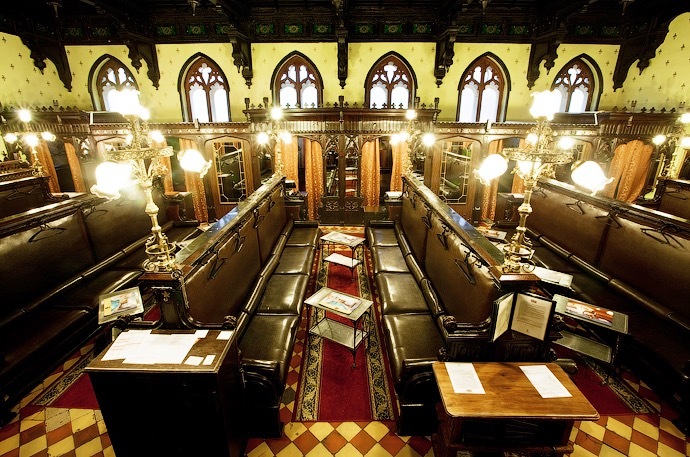 The main hall is decorated in Rococo style, while the changing rooms and recreation room is decorated in Gothic style, with large oak sofas and wooden ceilings, which gives it a medieval look. In this category you can find also the main pool of the Roman style complex. Admission for 2-hour visit costs 2,800 rubles. Children from 7 to 12 years old pay 300 rubles while children under 7 years old have free entry. Second Male Top Class. A little more economic (it costs 2,200 rubles the general admission fee of 2 hours) and with more modern style rooms. First Male Class. 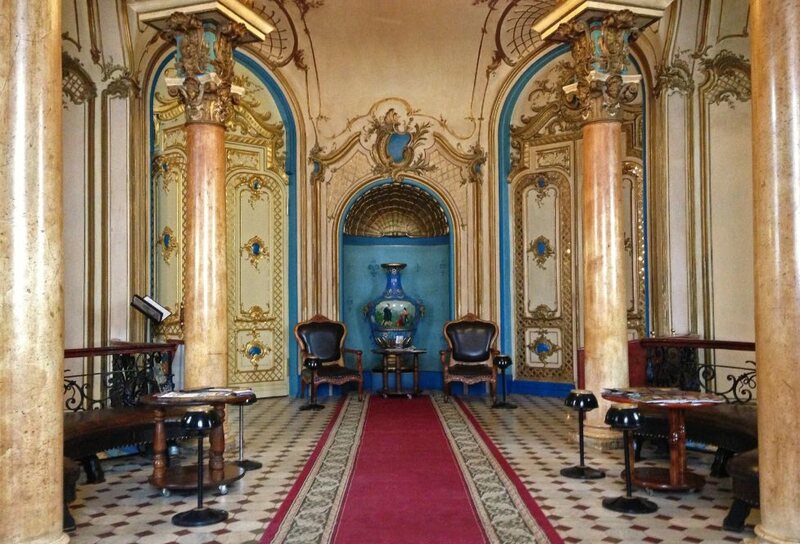 The entrance costs 1,800 rubles and the rooms interior is simpler and less ornate. For their part, women do not have a luxury superior category, but they can choose between Female Top Class (2,200 rubles) and Female Top Class (1,800 rubles). If you are looking for more privacy or enjoy the baths with your partner or friends, there is the option to rent private rooms, which have their own sauna and pool. They are open even at night. The room rent costs between 4,000 and 8,000 rubles, plus the extras you use (bathrobe, birch branches, hat, food and drinks, etc). The names of some of these private rooms give an idea of the decoration with which you will find inside: Soviet, Candaria, Kamchatka, Baikal, Roman. Kupetcheskiy (Merchant’s), Lukomorie and Sadko. 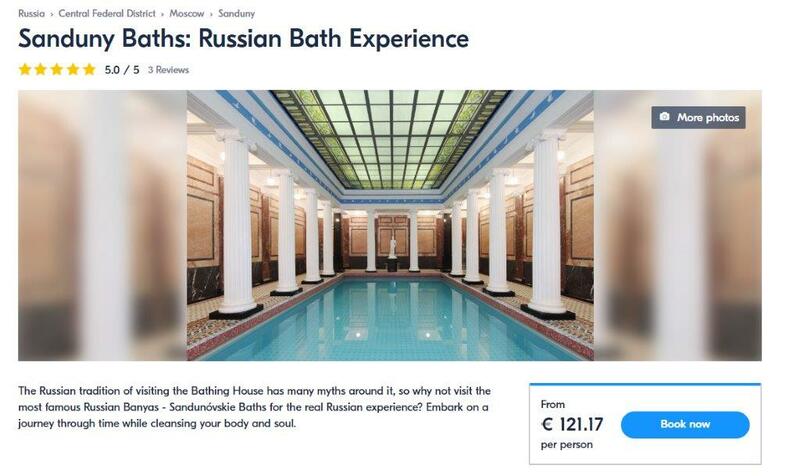 On the other hand, there are some companies that organize visits to the private rooms of the Sanduny Baths either for one person, couples, families or friends, with a pack that includes the pick-up at the hotel, a 3-hour ticket to one of private rooms, sauna, birch massages and towels. Have you ever been to a Russian banya? Tell us your experience below!